This article is about the historical figure that appears in Mario's Time Machine. For the character based on Albert Einstein in The Super Mario Bros. Super Show!, see Einstein. Albert Einstein talking to Mario. Albert Einstein was a German theoretical physicist who is famous for his contributions to modern physics, most notably for formulating the theories of general relativity and special relativity that rationalized the laws of physics that govern the universe. His formula for mass–energy equivalence, E=mc^2, was first introduced in 1905 and became intrinsically linked with him. In the NES release of Mario's Time Machine, he is visited by Mario in a laboratory after Mario travels back in time to 1905 return his stolen Physics Equation, which holds Einstein's famous E=mc^2. He is found in Japan wandering around a shrine. 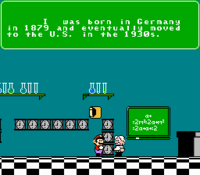 If Mario talks to him, Einstein mentions how he was born in Germany in 1879 and moved to the United States of America in the 1930s (despite Mario having traveled back in time to 1905, when Einstein still lived in Germany).